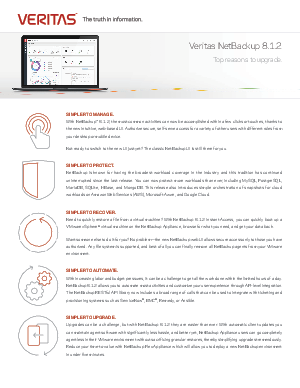 > B Channels > Veritas Netbackup 8.1.2 Top Reasons to Upgrade. With NetBackup™ 8.1.2, the most common activities can now be accomplished within a few clicks or touches, thanks to the new intuitive, web-based UI. Authorize secure, self-serve access for a variety of other users with different roles from your desktop or mobile device. Not ready to switch to the new UI just yet? The classic NetBackup UI is still there for you.